HOME > Key Organization, Storage and Key Identifiers > Restroom and Bathroom Key Tags > Standard Rectangle Restroom and Bathroom Engraved Key Tags > Restroom Key Tag - Standard Rectangle - 1 3/4" x 4 3/4"
Restroom Key Tag - Standard Rectangle - 1 3/4" x 4 3/4"
Our engraved restroom key tags are made in the USA of indestructible 1/8” thick ABS plastic with a durable acrylic cap (top color). The cap color is .012” thick and will not wear off. These bathroom keytags have a high mechanical and impact strength, which means they will not break when dropped. The Semi-Gloss finish is attractive and simple to clean. Unlike other manufacturers, we DO NOT use inferior standard styrene. Helps to prevent losing the keys to the restroom !. Restroom Key Tag - Standard Rectangle - With Custom Back - 1 3/4" x 4 3/4"
Jumbo Rectangle Restroom Silhouette Key Tag - 3" x 8"
Restroom Silhouette Key Tag - Standard Rectangle - 1 3/4" x 4 3/4"
Mens Restroom Silhouette Key Tag - Standard Rectangle - With Custom Back - 1 3/4" x 4 3/4"
XL Size 3" x 8" - 1/8" Thick Engraved Plastic. Image is on Both Sides. Available in 14 Colors. Standard Size 1 3/4" x 4 3/4" - 1/8" Thick Engraved Plastic. Image is on ONE Side. Available in 4 Colors. Double Sided Medium Rectangle Men's Restroom Keytag - 1 3/4" x 4"
1 3/4" x 4" - 1/8" Thick Engraved Plastic. Image is on Both Sides. Available in 14 Colors. Jumbo Rectangle Mens Restroom Silhouette Key Tag - With Custom Back - 3" x 8"
Tag Size: 3" High x 8" Long and 1/8" DOUBLE Thickness Microsurfaced Acrylic, Color on BOTH Sides. Price includes your personalized text or wording on BACK side, up to 4 lines. 3" x 3" - 1/8" Thick Engraved Plastic. Available in 4 Colors. Tag Size: 3" Round and 1/8" DOUBLE Thickness Microsurfaced Acrylic, Color on BOTH Sides. Price includes your personalized text or wording on BACK side, up to 6 lines. Tag Size: 3" High x 3" Long and 1/8" DOUBLE Thickness Microsurfaced Acrylic, Color on BOTH Sides. 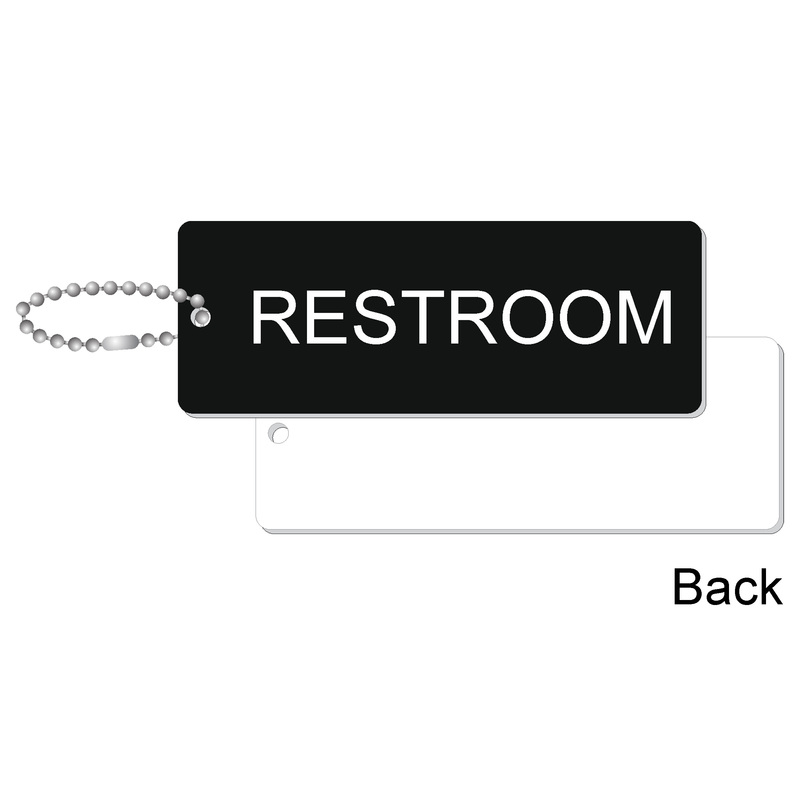 Medium Rectangle Women's Restroom Keytag - 1 3/4" x 4"
1 3/4" x 4" - 1/8" Thick Engraved Plastic. Available in 4 Colors. 3" Diameter - 1/8" Thick Engraved Plastic. Image is on Both Sides. Available in 14 Colors.